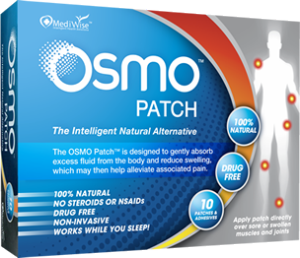 Together with proper rest the OSMO Patch is the ideal way to naturally relieve joint inflammation, swelling and associated pain. Order the OSMO Patch TODAY! – Worldwide Deliveries. Effective Relief of inflammation & associated pain. Less then the price of a visit to the specialist! All orders packed & dispatched on or before the next business day! Risk Free – 100% No questions asked Money Back Guarantee! Flat Rate fixed priced shipping! IMPORTANT: Not suitable for use on individuals allergic to seafood or shellfish.